Andrew Schofield is a PADI Course Director with strong ties to the diving community in Townsville and Magnetic Island. Having been born in Zambia, and growing up in Canada, the U.S.A., Guatemala, and Colombia, travel and adapting to different cultures and life-styles has been a constant in Andrew's life. Upon graduation from university he moved to Japan, and later Australia to pursue his vocation as a teacher. When Andrew came to diving in 1997 in Australia, it initially appeared to be just another adventure to undertake. After returning to university for a graduate degree in Education, and then a foray into a career in technology in California, it became apparent that Andrew's passion for diving, and love for education could be easily married by his becoming a member of the diving profession. For the past nine years, he has been realizing that dream. Andrew began his diving career at Utila Dive Centre in Honduras, a PADI Career Development Centre, and one of the most successful dive centres in the world. After doing his IDC and then continuing his education by becoming a Master Scuba Diver Trainer, Andrew was offered a job at the highly competitive dive shop. He worked at UDC for another year and a half, progressing to become a senior member of staff and a PADI Staff Instructor. 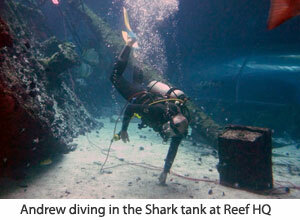 Andrew taught all levels of diving, including Assistant Instructors and assisting in Instructor Development Courses. He also became one of the first semi-closed rebreather instructors in Central America. After a short stint working in Costa Rica, Andrew took over the ailing Reef Gliders dive centre in Roatan, Honduras. As manager, he elevated the dive shop to PADI 5-Star status and turned the operation into one of the busiest shops in the thriving West End. He also became one of the founding members of the Sandy Bay - West End Marine Park. Nicaragua, and the beautiful Little Corn Island was the next stop for Andrew. This extremely remote island in the Caribbean became home for the next year as Andrew undertook the task of building the small Dive Little Corn into a thriving business. Bringing DLC up to PADI 5-Star dive centre status was one of his first priorities. After a wonderful 12 months on the island, Andrew packed his dive bag once again and moved to the other side of the planet. Returning to the town the entire dive adventure had begun, Andrew moved to Townsville in North Queensland, Australia. He is now a proud Australian. Having spent nearly 3 years as the Training Director at the PADI 5-Star dive centre, Adrenalin Dive, he struck out on his own to pursue his goal of expanding diving options in North Queensland. Continually looking to improve and expand the dive offerings everywhere he goes, he is currently working to promote Specialty and Professional diver training in the region as well as teaching Nationally Recognised First Aid, Oxygen, CPR and AED courses and managing a thriving Equipment Servicing business.